The best account that I have seen is Robert Louis Stevenson's account of his trip west titled Across the Plains. This provides a fairly graphic account of traveling with the lower classes on the Union Pacific portion of the transcontinental trip. Unfortunately, it does not address issues of moving furniture and animals. I'd have to agree with Larry. Not even Union Pacific would permit people to travel with animals and neither of those to travel with furniture. Too much chance of serious to fatal accidents riding next to large stock like cattle and horses. Stock cars always had slatted sides, at least all the ones I ever heard about. People and furniture would be too subjected to the weather to even consider doing that, emigrant or not. The railroad wanted them to arrived fresh and healthy and ready to farm. But then again, I have been wrong so often that I could be wrong once again. Copernicus called. You are not the center of the universe. Thanks to you both for responding. I have documentation on boxcar travel, including fares for different animals, equipment and people from Great Northern. It may be that UP did not offer this "service." 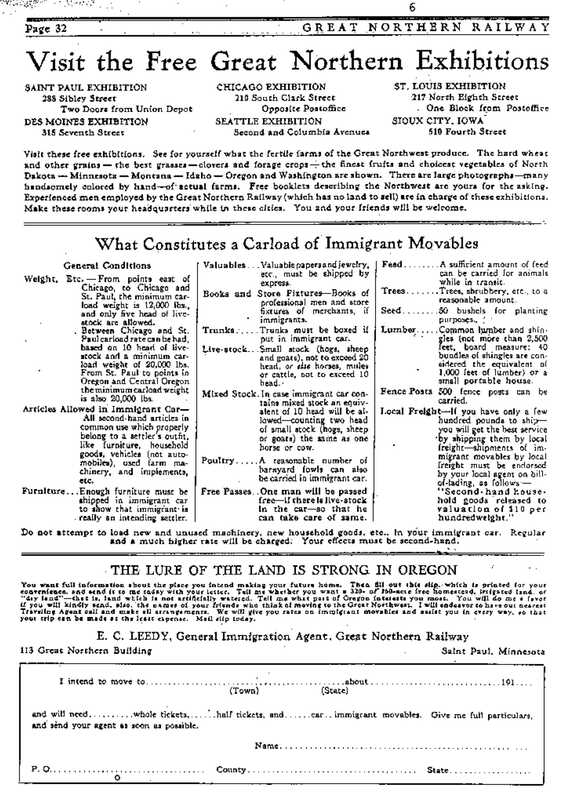 Check out the following for a Zulu boxcar emigrant move. A move west by southwest from southern Nebraska to a location in northern Kansas nearly 200 miles west. 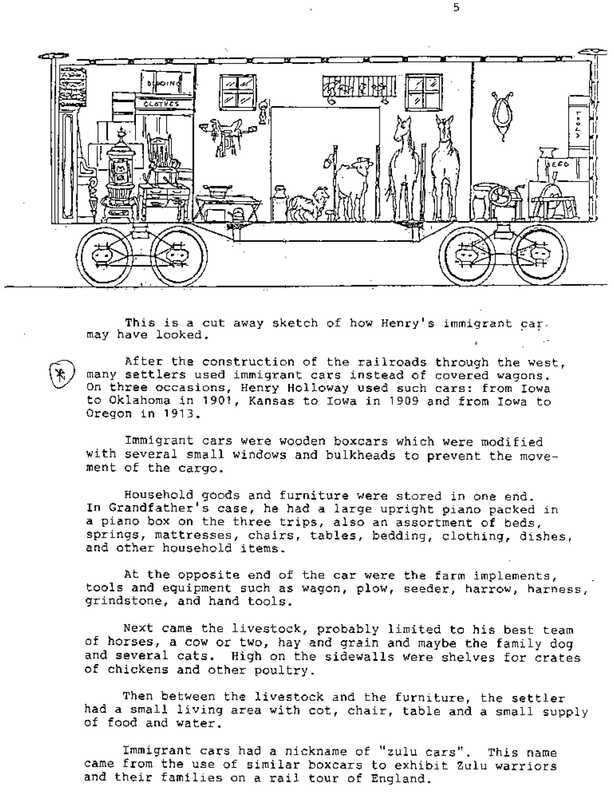 I note that the term Zulu car was also applied to actual emigrant passenger cars many times, not just the boxcars used for moving families. Hi .. thanks for the bit on Zulu ... gives me another "angle" to google. Here's two things I have on the immigrant cars. One is a fare schedule for the Great Northern RR. The other is from the family records of a man in Jefferson Iowa. I am also enclosing an excerpt from this site. The emigrant train which had brought them from Iowa consisted of several freight cars and one passenger car. In the freight cars were all the livestock of the various families-horses (two named Billy and Kate) and several cows, one of which was a fine Jersey. The other freight cars carried the plows, harrows, and other farm equipment which my father had purchased at cost from the Ohio Cultivator Company, Bellevue, Ohio, and the Fuller and Johnson Manufacturing Company, Madison, Wisconsin, for whom he had been a representative. At one end of the passenger car was a large cast iron stove which was kept constantly burning. On this the milk for the babies was heated and other food prepared. The majority of the food, however, had been prepared in advance by the women who had spent many hours baking bread and other edibles which would keep them supplied during the trip, with some to spare for their first days on the homesteads. I would be very grateful for any other info you can find.